I couldn’t help it. Halloween’s almost here, I had to trip down the memory lane of Halloweens-past. 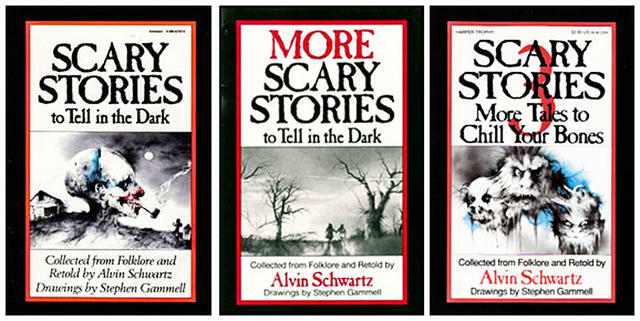 The “Scary Stories” books were what I looked forward to most as a child and best thing I discovered in daycare. When I found these books compiled into a single volume–25 years later–that giddy kid who couldn’t resist smuggling ragged paperback copies to school with me each October came out to play, and I snapped it up from the bookstore shelf. Yes, those were the days when “banned books” meant (at least) a hairy-eyeball from teachers and librarians, not a special space on the wall each year…call me a literary rebel with a cause? The Scary Stories Treasury is comprised of three books of collected folklore re-told by Alvin Schwartz: Scary Stories to Tell in the Dark, More Scary Stories to Tell in the Dark, and Scary Stories 3: More Tales to Chill Your Bones. The contrast between reading these as a kid (or hearing them read to you) and then reading them again as an adult, is a pretty big one. Over time with more books in my brain-pan, I’ve found more complex versions of these stories. Now, with my age, they just don’t scare like they used to. However, that doesn’t stop me from enjoying them at all. And if I’m honest with myself, not many of them did scare me…it was the experience of having them read to me for fun that made it so good. But more than that, it was a scary good time to read with those fabulous illustrations. I was lucky enough to find the version with the original drawings by Stephen Gammell. Honestly, I think the drawings were scarier than the original stories…or maybe they heightened the scares when you had to read them to yourself. They worked wonderfully, and even today I’m a bit creeped out and in awe of the style. I’ve never seen anything like it since…and am so glad I got this version. I found another version with a different illustrator that had come out in the past few years…but I didn’t want to get that one. It just wouldn’t feel the same, but I’ve heard some people like the style. As an adult, I can remember actually learning more about these stories by reading the endnotes. I think this is the first book where I’d ever read the endnotes…and I did that as a kid! There’s a lot of info on where the stories come from (and were re-written to be simpler and more kid-friendly, I suppose) and some alternate versions of the stories or their endings. One great story from the third book (“Maybe You Will Remember”) made me want to do some research on what actually happened to Rosemary and her mother…as supposedly it’s based on things that have actually happened at some point. That one really creeped me out. Now I wanna research again. 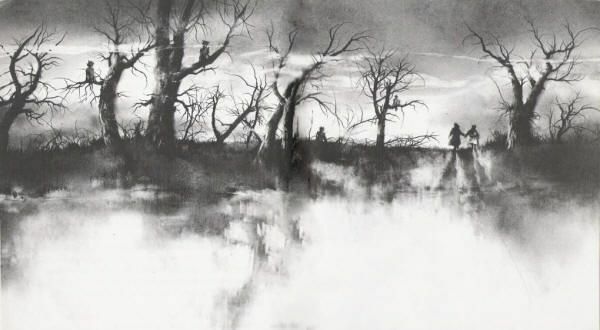 Anyhoo, for reading aloud to a new generation, or remembering with nostalgic fondness for yourself, The Scary Stories Treasury is a must have for all ages. I put it up there with the Shel Silverstein poetry books–you can hang onto this one for life and still enjoy the hell out of it.